Boyce (Lisa and John Pritzker Distinguished Professor of Developmental and Behavioral Health, Univ. of California, San Francisco) and his sister Mary, both red-haired and freckle-faced, were born into the same California family in the middle of the 20th century. A graduate of Stanford and Harvard, Mary was derailed by chronic illness and schizophrenia. 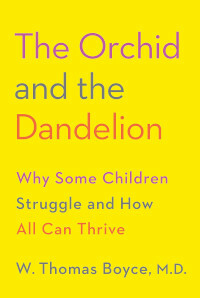 A pediatrician and researcher, Boyce has spent more than four decades observing children similar to his sibling, discovering two primary prototypes: the dandelion (hardy, resilient, and healthy) and the orchid (sensitive, susceptible, and fragile). The author argues that genetic makeup and environment shape behavior, yet with attention and nurturing, orchid children can survive and thrive even beyond their dandelion peers. Furthermore, each child possesses unique abilities and strengths, and by harnessing them, parents can help their child grow in spite of socioeconomic and environmental disadvantages. Recognizing his friend Samuel Johnson’s need for company, artist Joshua Reynolds suggested that they meet with a few friends each Friday night at the Turk’s Head Tavern on Gerrard Street in London. In February 1764, the Club, which still exists, began with an initial membership of nine. Over the next 20 years, until Johnson’s death in 1784, it would consist of many of Britain’s leading writers, thinkers, and politicians, including Edmund Burke and Oliver Goldsmith (original members), Johnson’s biographer James Boswell (elected 1773), Whig leader Charles James Fox (elected 1774), economist Adam Smith (elected 1775), and playwright and parliamentarian Richard Brinsley Sheridan (elected 1777). Damrosch (Harvard Univ. ; Eternity’s Sunrise: The Imaginative World of William Blake) presents extended biographies of Johnson and Boswell, mingled with shorter sketches of the group’s other members. While this book offers no new information, as Johnson observed, “Men more frequently require to be reminded than informed,” Damrosch’s account reminds readers why this circle of creativity continues to fascinate. Emergency physician Gillespie (Univ. of Tennessee Sch. of Medicine) sets out to help herself and other moms beat the odds, having learned that for every child a woman has, in addition to the risk of obesity rising seven percent, she’s likely to experience poor nutrition, lack of exercise, sleep less (no shock), and myriad pregnancy-related complications. The author dedicates the first section to nutrition and ideas for developing healthy eating habits tailored to one’s specific body chemistry (e.g., bulk cooking produce in order to eat more vegetables, combining flavors that make food more satisfying, and involving children in the meal-planning process). Part 2 considers exercise: finding pockets of time to work out, using music to motivate, and getting back on track after a setback. For increasing sleep of both mom and child, Gillespie advocates exercise, meditation, and cognitive techniques and troubleshoots issues for children of varying age ranges (newborn to four). The final section addresses key issues such as mommy guilt, the need to stop multitasking, exhaustion, and prioritizing relationships with one’s partner and friends. When a brutal murder occurs, there is often a public outcry about how mass media is to blame. This is not a modern phenomenon. In the 1830s, the true crime–focused Newgate Calendar, published by the administrator of London’s Newgate Prison, recorded the crimes of the incarcerated and led to a genre known as “Newgate novels,” which glamorized the life and death of highwaymen and blackguards. Even Dickens’s Oliver Twist was counted among them, though the famous author discouraged the label. The most prominent title in this genre was William Ainsworth’s Jack Sheppard. This novel and the plays it inspired were frequently accused of corrupting the lower classes. Then, in 1840, the brutal murder of Victorian gentleman Lord William Russell brought the controversy to a head when his valet, a suspect in the case, was found to be reading Ainsworth’s work. Author Harman ( Charlotte Brontë: A Fiery Heart) gives a fascinating account of a murder and its social ramifications and points out the unanswered questions that were overshadowed by the scandalous trial and public moralizing. Journalist Kahney’s (Jony Ive: The Genius Behind Apple ’s Greatest Products) new biography about Tim Cook, who took over the helm at Apple after the death of Steve Jobs in 2011, is a moving portrait of an exceptional businessperson. We learn that Jobs and Cook shared many similarities, even if their styles of management were ultimately very different. The work details Cook’s revolutionary approach to manufacturing and outsourcing, along with the impacts that his business choices have had on Apple and consumer electronics worldwide. This book is a welcome addition to the cannon of all things Apple as it uncovers and reports much of Cook’s early career trajectory. In dealing with Apple’s historical controversial environmental choices, Kahney shows Cook to be an executive of high ethical character who worked decisively to make the firm greener and more environmentally friendly. VERDICT A solid and compelling biography that is recommended for readers who enjoy pop technology titles and business profiles.—Jim Hahn, Univ. of Illinois, Urbana, Lib. RAND senior political scientist Mazarr ( Rethinking Risk in National Security) writes an exhaustive interpretation of the beginnings of the Iraq War and provides an important historical evaluation of American foreign policy. The author’s argument that the path to the conflict was typical of modern foreign policy efforts is heavily supported by lengthy citations, although some interviewees wanted to remain anonymous and identified only by number, reducing their credibility. Mazarr argues that U.S. administrations are generally populated with officials who believe collective myths about Iraq and are emboldened by personal visions that are not always reflective of reality. He continues that unchallenged military power, moralistic imperatives, messianic tendencies, and an overeager ambition to solve international disputes have impelled American leaders to process issues in terms of values rather than consequences. As a former professor of national security strategy at the U.S. National War College, Mazarr lends expertise and authority to this subject. Preger-Simon, a founding member of the Merce Cunningham Dance Company, here recalls her mentor and lifelong friend. Cunningham (1919–2009), renowned choreographer, talented dancer, 1985 MacArthur Fellow, and recipient of numerous awards for contributions to the arts, developed highly athletic, nonnarrative choreography that broke from traditional dance style. It was praised by many, though it left some audience members perplexed. Preger-Simon calls on letters and diaries and her recollections to re-create her experiences with Cunningham, from their first meeting, in 1949, when she was 20, to her final good-bye, 60 years later. She offers insights into Cunningham’s creative processes and his collaborations with his life partner composer John Cage and others, as well as fond memories of road trips, dance exhibitions, and meaningful roles. Starry-eyed journal excerpts from early years give way to more seasoned (yet still unabashedly enthusiastic) analysis as time passes. Preger-Simon includes occasional photos of Cunningham, company members, and herself, along with brief sources notes. Originally published in 1998, this updated edition of If I Can Cook/You Know God Can includes meditations on Shange’s ( For Colored Girls Who Have Considered Suicide When the Rainbow Is Enuf ) childhood and life as a black playwright and poet. Shange, who died in October 2018, writes in a casual, friendly style of a friend visiting and sharing her best dishes and stories. Along with plenty of recipes, the collection also sheds light on the life experiences of a woman in the Black Arts Movement and the relationship between blackness and art. VERDICT An appealing collection for fans of Shange’s work and students of African American studies.—Ginny Wolter, Toledo Lucas Cty. P.L.